It is most gratifying for me, when I visit Ta’ Pinu, to see young people, couples and families with rosary beads in their hands sitting in front of the mosaics that have been embellishing the sacred space in front of the Sanctuary. The presence of these pilgrims gathered in prayer is noticeable also at night. I believe that these persons reflect what happens in evenings within many of our homes, where the families sit around a table or retire to bed praying the Rosary. Now that we are in the month of October, known as the Month of the Rosary, I wish to say a word of appreciation to those who love the Rosary and, at the same time, invite others to consider saying this prayer that is so simple and, at the same time, profound. One hundred years ago, on the 13th day of October, exactly during her last apparition in Fatima, the Mother of Jesus presented herself to the three young shepherds, Lucia, Francesco and Jacintha, as “Our Lady of the Rosary”, and told them to say this prayer frequently. One hundred years ago was a time of discouragements and uncertainties. Portugal was passing through a political, religious and social crisis, while Europe was seriously threatened by the Great War. But in spite of the presence of those dark clouds, while Our Lady made a call for conversion, prayer and penance, she showed them that Jesus was there to help them, and she assured them that eventually the love of God would conquer all problems. In fact, the message of Fatima is one of hope: in Fatima God seems to have opened ajar the window of hope even when man had closed the door to him. Therefore, in order to pick up courage and avoid being confused by the varied challenges we have today, I propose taking the rosary beads in our hands. The Rosary is a prayer that places us at the heart of the mystery of the Redeemer. Reflecting on the Joyful, Sorrowful, Glorious and Light Mysteries makes us aware of how much Jesus loved us and still does. When we pray the Rosary correctly, we feel Jesus close to us and ready to share with us the burdens of life. 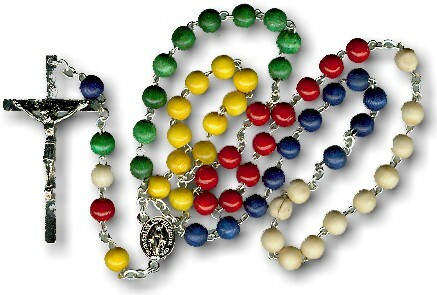 The Rosary is a channel through which we receice the mercy and goodness of God. This is a motive that strengthens us in hope. Therefore, the Rosary is not a chore but it relieves our burdens. Dear families, during this month of October, the Holy Virgin, Mother of the Family, wishes to come live with you so that you pray the Rosary together with her. Mary’s hands are a ladder for Jesus to come down and live with you. I make this appeal particularly to those families with young children, because saying the Rosary together makes you a school of prayer. I cordially encourage the grandparents who, as Pope Francis often says, pass the faith to their grandchildren, to teach this beloved prayer to the little ones and allow them to taste the love of Mary for them. I recommend to all schools, as well as the cathecism centres, to help the children to learn how to pray the Rosary with love and devotion. Given from the Bishop’s Curia, Victoria, Gozo, today Friday, 29th of September 2017, Feast the Archangels Michael, Gabriel and Raphael.